We knew we had a DC Thomson special in this catalogue as this Beano Book from 1944, somewhat rarer even than the first issue, was in the relatively high grade of Fine Plus. 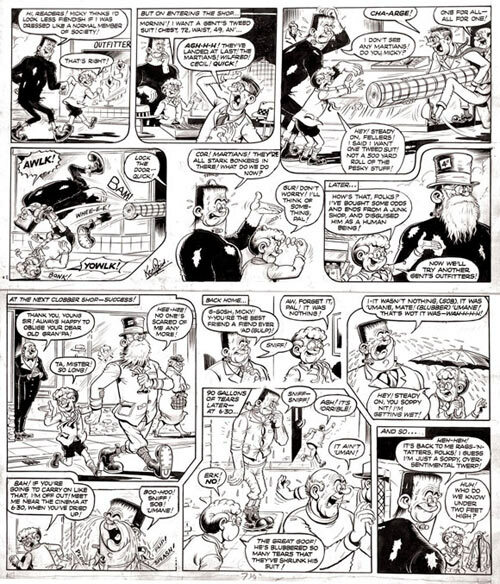 Also this was the first annual to combine the characters from the recently terminated Magic Comic with those of The Beano. There were bids from around the world, an ex-pat in the USA finally securing his treasure for £3,750. 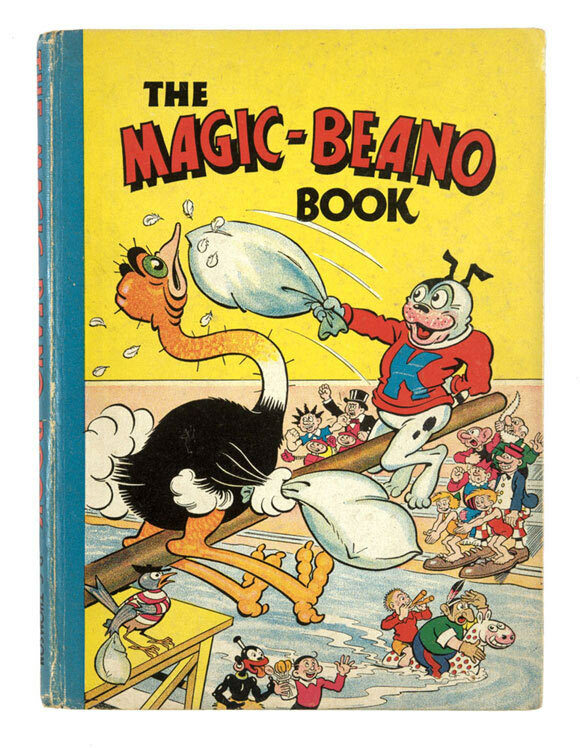 Magic-Beano indeed. 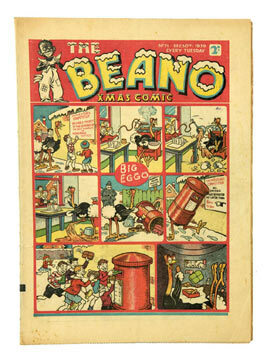 Here was the Beano Xmas Comic of 1939 with a small piece missing from its top cover corner, but no-one was missing its fresh appearance and a record £330 was tendered. 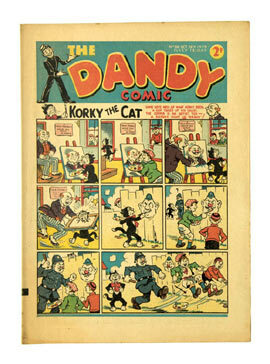 Dandy Comic was represented by most of the issues from 19 to 109. The average price in quite good grades was £70-80 each but outstanding was the centenary propaganda war issue No. 100 with Desperate Dan sinking the entire German navy, along with Hitler's car! This Very Fine example was bid to a very fine £231. 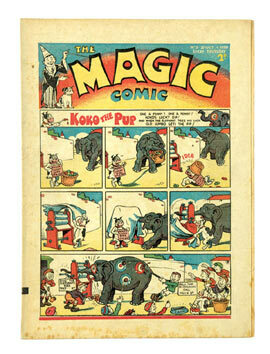 Our run of early Magic comics continued with these two early issues at £110 each. 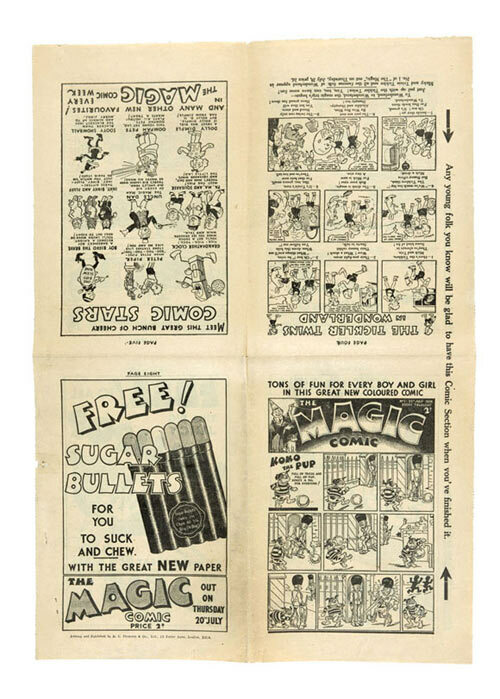 The original flyer for No 1, an 8-page mini comic in its own right, introduced Koko The Pup, The Tickler Twins, Sooty Snowball and Peter Piper by Dudley Watkins. The flyer flew to £82. 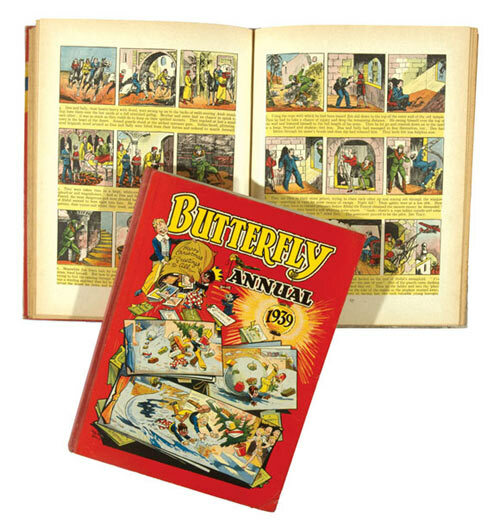 There were only two Butterfly annuals published and here they were in high grade. To add to that they were issued during the war in 1939 and 1940 so it was no surprise that our butterfly collectors were ready with their nets. Preserved at £220. Usually the 'Big Five' free gifts booklets don't attract much interest without the story papers to go with them, but, as always, high grades are viewed differently and when Dudley Watkins is responsible for most of the cover art the picture changes dramatically. 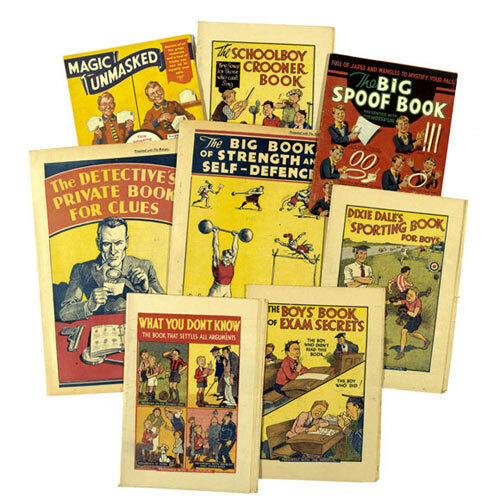 These 8 large format examples covering Detective Clues, Self-Defence, Magic Tricks and Crooning tuned up to £104. 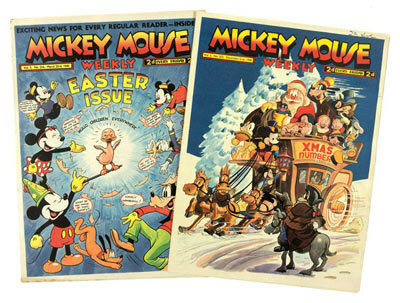 Mickey Mouse annuals don't survive in good condition, probably due to their thick, coarse paper stock degrading the spines with the pages prone to major foxing. 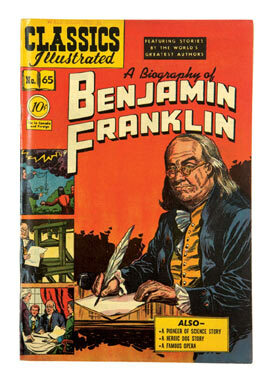 This has allowed many worn copies to infiltrate the marketplace over the last twenty years and values are low. Not so the comics. 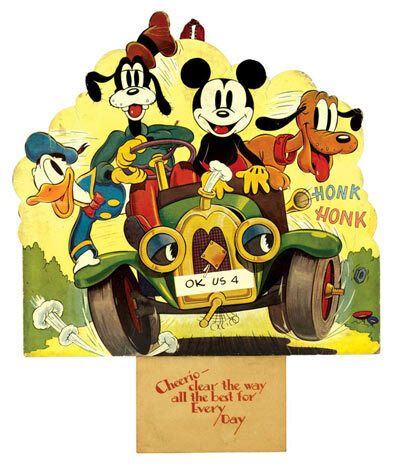 The latest techniques were used in publishing Mickey Mouse Weekly during the Thirties with colour photography and bleach whitening introduced to the paper making process. 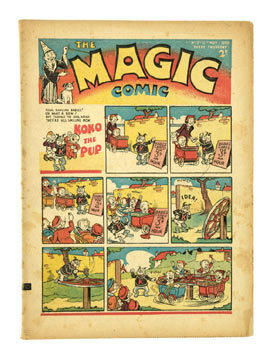 This 'photogravure' technique ensured the colours would stay bright and fresh on the surface lengthening the life of the comics as well. 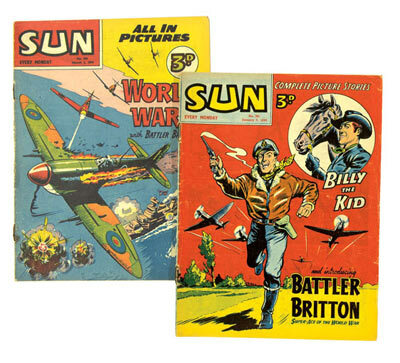 Even so, the war years took their toll in paper collection so high grade copies are hotly contested. The complete year for 1940 illustrated above took £683 with 1941 at £551. The very rare calendar from 1939, not seen before, made a first date at £110. Mickey Mouse Strongly. During the war publishers G.G. 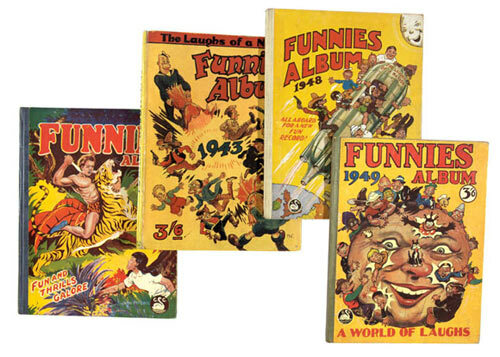 Swan produced quirky titles Topical Fun, New Funnies, Slick Fun, Fresh Fun, Thrill Comic and War Comic. These low production issues are scarce and were amalgamated as yearly albums to cash in on Christmas sales. Here was an almost complete run from 1942-1956 and £180 for the 14 issues valued them at a very reasonable £12 apiece. 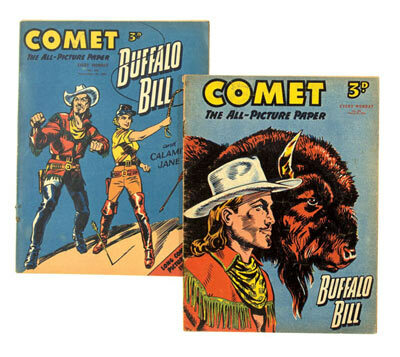 Comet and Sun were very popular in the mid Fifties starring Buffalo Bill, Strongbow, Billy The Kid and Battler Britton but the comics' colour centre spreads were also innovative with long running series like Knights Of The Round Table and The Happy Hussar. Prone to our old friend Rusty Staples, grading never gets much further than vg+ but £221 each for the complete years of Comet 1954 and Sun 1956 restored some of their shine. Captain Falcon headed the Rocket's front cover but this younger cousin of Col. Dan Dare, further removed by The Lion's Captain Condor didn't have much to say that already hadn't been said, interplanetarily speaking. 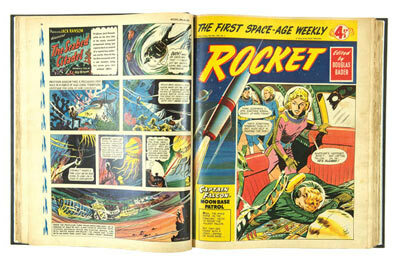 Buffed up by US reprints of Flash Gordon, Brick Bradford and Johnny Hazard, the comic's unique collectability was forged in issues 13-27 where the new Fobidden Planet movie starring Robbie The Robot was illustrated and free cinema tickets were offered to Rocket Club members. The complete 32 issue run fizzed to £374. 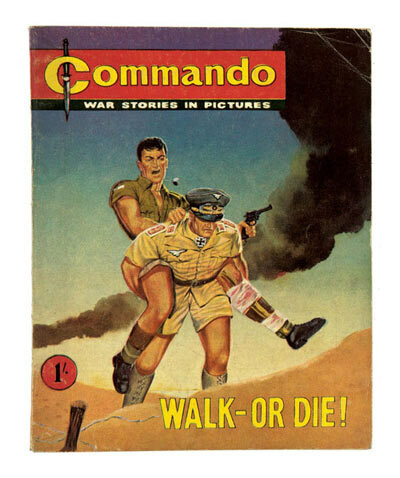 DC Thomson's brilliant creation, Commando War Stories In Pictures, was the forerunner of all the 'pocketbook' war titles and is highly collectable today. When we first offered a run of these issues in 2002 we assumed that the No 1, with a record breaking £440, would stand for a very long time but here was a similar graded copy which almost doubled that price to £826. Issues 2-6 commanded between £110 and £137 each. Walk - Or Die! They ran. Dennis fits rockets to Dad's garden hammock, but just before ignition, Dad sits down to read his paper in peace - now he's reading it in pieces. Davy Law's brilliant artwork lifted off to £854. To look less fiendish, Mickey takes Frankie to the Gents Outfitters for a tweed suit: 'Chest 72" Waist 49"...' but the staff think the Martians have landed and biff them out the door. 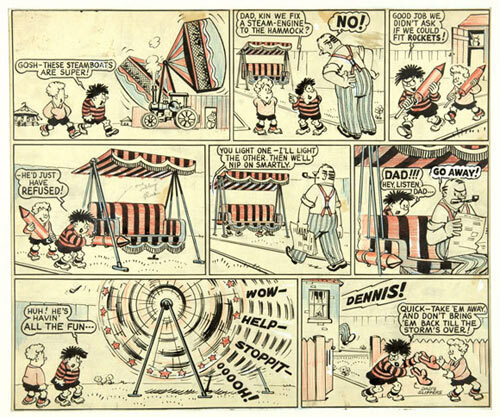 Ken Reid's Frankie was biffed to £440. It's Hallowe'en and Oor Wullie puts a turnip in the shed for lantern carving after school. His pet moose, Jeemy, has other ideas - and now a full stomach. Drastic action is taken And Jeemy's put up for sale...he gets £605. 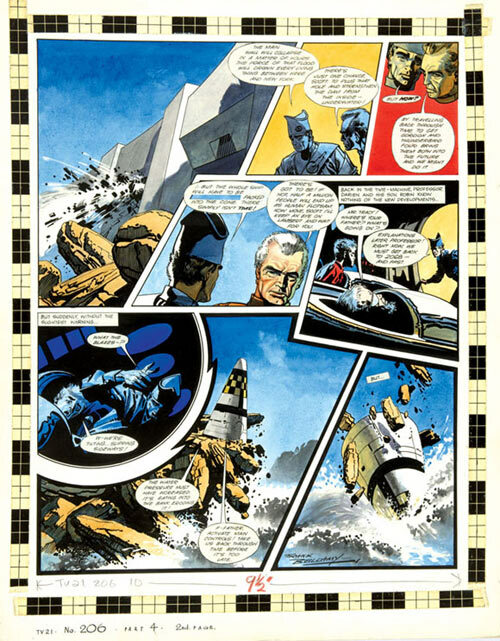 Frank Bellamy's Thunderbirds had Scott and professor Davies travelling back in time to get Thunderbird 4 and save New York from drowning. The artwork was extremely buoyant at £2200.. 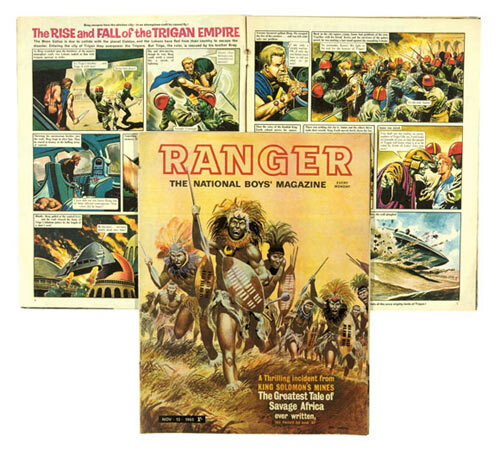 Here was the complete 40 issue run of Ranger starring The Rise And Fall Of The Trigan Empire by Don Lawrence and Mike Butterworth. There were also 3 issues with covers by Don Lawrence and £264 was a good price for more than a lone Ranger. TV Tornado in its complete run of 88 issues was hotly contested to £341. 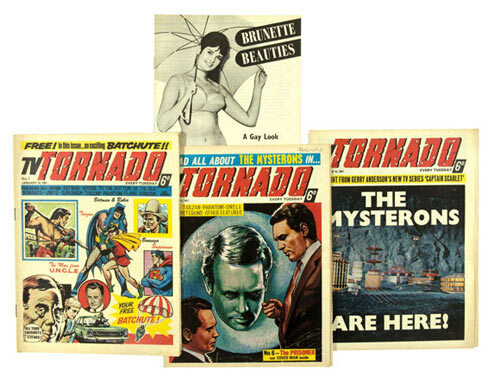 Starring Batman and Superman US reprints, Bonanza, The Lone Ranger, The Mysterons, The Saint by Harry Bishop and Voyage To The Bottom Of The Sea, TV Tornado was not short of star power or diversity amongst its stories. Being offered with Parade's supplement 'Brunette Beauties' (voyage to the bottom?) suggested there was something for everyone. 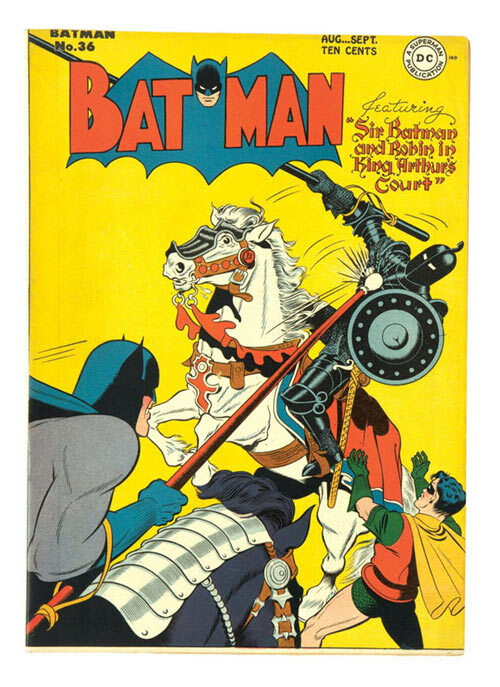 Sir Batman and Robin in King Arthur's Court with bright yellow cover is a 1946 rarity in vfn/nm grade and £935 repatriated this copy back to the USA. 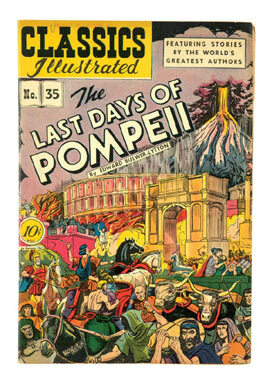 These two Classics Illustrated issues of The Last Days Of Pompeii and Benjamin Franklyn had full cover gloss with light owner stamps and represented good value for the winning bidder at £55 and £44 respectively. As I write this article on December 20th Britain is snowbound, the airports are at a virtual standstill and the road and train network not-work. It was reported on TV that there was no progress along a six-hour queue for Eurostar which stretched 3 blocks in the freezing cold from London's St Pancras station to the steps of the British Library. Now if that queue was ever to stretch in the opposite direction that would be real progress.